Notes: Based on the manga by Kiichi Hotta, serialized in Gangan Powered Monthly GFantasy. This review covers both seasons. 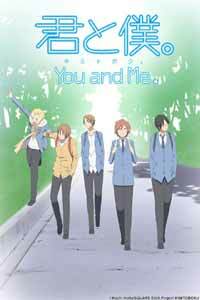 In their second year of high school, friends-since-kindergarten Shun Matsuoka, Kaname Tsukahara, and Yuta and Yuki Asaba acquire (with rather mixed feelings) a new member, Chizuru Tachibana, and together they tackle the challenges of daily life as well as the early stirrings of maturity. I have to admit at first I found the cast of You and Me a bit off-putting, but I changed my mind when I got to know them better. The first one we meet is Shun, who's not exactly traditionally masculine: we see him initially with long hair, he speaks in a gentle tone (and is the peacemaker of the group), likes to cook, and is occasionally actually mistaken for a girl. One's first impression of Kaname is as just a crabby curmudgeon with glasses. He's the sort who complains profusely if his familiar routine is disturbed (and thus is particularly annoyed by Chizuru, a routine-disturber of extraordinary magnitude who we'll meet shortly.) On the other hand, we see that even in kindergarten Kaname was the guy who sacrificed himself for the others, and still basically functions as the group's (rather martyred) mom. He's also surprisingly good with kids, given his irascible nature. There's a weird thing going on with his own mom- she often acts strangely immature, more like his neglected girlfriend than his mother. He rather brusquely brushes her off when she's like this, but maybe shows some evidence of a mother complex himself in an obsession with older women. His first crush was on his kindergarten teacher, and he currently has one on the older of two sisters who live next door, Shizuna Aida, though Shizuna's younger sister Hisako, Kaname's classmate, seems more likely to return Kaname's feelings, if he'd just direct them her way. Here and elsewhere in this show, it's painful to watch people being unable to say what's actually on their minds, maybe more so because of our own regrets about things we wish we'd said at that age. Chizuru seems to add discord to the bunch, but his personality actually complements theirs. He's half-Japanese; they don't just draw him blond, his "straw-colored" hair gets referenced in their conversations, and when he first met one of them, Yuki, years earlier, he couldn't even speak Japanese. He's exuberant and irrepressible, a "class clown" who's tactless and awkward, a well-meaning soul but one whose poor judgment and lack of caution frequently get his new pals in hot water. He has a crush on a girl named Masaki Sato (who he calls "Mary"), but in classic triangle fashion Masaki only has eyes for Shun. Speaking of Shun, he has a younger brother named Fuyuki, who's quite the opposite of Shun, acting boorish in that way that many adolescent males seem to feel obligated to act. Fuyuki even has a girlfriend, but his first attempt to get physical with her doesn't exactly go as he thought it would, in one of those rare depictions of teenage sexuality that recognizes how even taking the first step can introduce unexpected complications in an inexperienced young couple's feelings about each other. This is a genuinely adult consideration of the opening stages of sexuality, and shows just how juvenile much "adult" fare really is by contrast. The show has quite a bit of humor, but it tends to stay low-key and realistic above all; episodes where the humor dominates over the drama, like the manga one, are less common. I kept having bouts of deja vu throughout the show; I could recognize bits of myself and my own experiences at their age in Shun, Kaname, and Chizuru; not so much in the twins (I was never one of those folks who could do things effortlessly, and was certainly never that charismatic), though Yuki did have one thing happen to him that struck a familiar chord. I suppose the main complaint I have is that I thought there should have been more time given to some characters, and less to others. Yuki and Chizuru get a lot of screen time, maybe deservedly so as the show's reprobates, but Masaki gets a lot of attention too, and I thought she was a rather weak character. On the other hand, Kaname seems an interesting case study, particularly in regard to the women in his life, and while we see a good bit of his childhood, we don't see that much that might be of interest about his current relationships with women (mom excepted), until an episode near the end of the Second Season, an episode that in its way is as emotionally complex as the episode with Fuyuki and his girlfriend. It's a meditation on the idea that sometimes vague hopes and dreams must yield to reality, and in its "grass sumo" game it finds achingly beautiful symbolism for its bittersweet message. So much of the dialogue here is laden with implicit meaning, but it's completely accessible to the audience; we know exactly what's going through everyone's heads here, whether they can say it or not. Recommended Audience: I would guess that the only thing here that anyone might have problems with is Fuyuki's crass adolescent posturing and his attempt at getting physical, but the latter is utterly honest in how it's played and not a bit exploitative. Older teen to adult OK.